He wouldn’t. He couldn’t. Accompanying these sentiments are a chorus of gasps when I perform one of my favorite party tricks at Barbecue University. I fire up a kettle grill and grab a pint of Haagan Dazs and proceed to smoke the one food you probably never dreamed you could grill: ice cream. I wish I could say I invented grilled ice cream (I did invent this particular technique), but I stand on the shoulders of giants. I got the idea from Spain’s mad scientist of the grill: Victor Arguizoniz. To look at him—white T-shirt and sneaks, grey slacks, hair swept back like some Basque Kevin Costner—you’d never guess he has quietly stood traditional European live fire cooking on its head. No food is safe from the one-of-a-kind grills at Victor’s restaurant: Asador Extebarri in the tiny hamlet of Atxondo in Spain’s Basque country Not kokotxa—hake throat—which tastes like fish and slithers down your throat like an oyster. Not butter, which Arguizoniz smokes with oak to spread on, what else, grilled bread. Not even milk, which he smokes in a wood-burning oven to make a smoked ice cream that, like everything he serves, will take your breath away. Admittedly, ice cream may seem like the last food you’d attempt to grill, but wood smoke gives it an otherworldly dimension. Sure, you could smoke the cream with a handheld smoker or in a smokehouse, then churn the ice cream from scratch. But there’s a far easier way to do it: indirect grill it on a kettle grill amid fragrant clouds of wood smoke. But won’t it melt? you worry. Normally it will, but you, clever griller, will smoke-roast it on a slab of ice to keep it cold during grilling. You’ll add unsoaked wood chips to the fire to generate lots of smoke in a hurry. And you’ll work fast—a couple minutes will do it. OK, so you can smoke ice cream. Why would you bother? 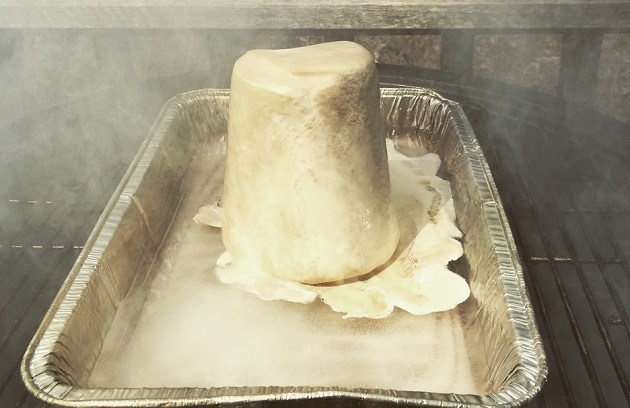 Because smoke is the umami of barbecue, and in this case wood smoke gives ice cream a haunting quality that will make you think of a fire roasted marshmallow. (It will also remind you of the wonderful way your clothes smell when you sit around a campfire.) In short, it will be the most remarkable ice cream you’ve ever tasted and from this moment forward won’t want to live without it. The bragging rights speak for themselves. Shop: To make your life easy, start with a good commercial vanilla ice cream, like Haagen Dazs or Talenti. 1. Fill a metal mixing bowl 3/4 of the way with water. Freeze it solid in the freezer. 2. Set up a charcoal grill for indirect grilling and heat to medium-high (400 degrees). 3. Turn the ice cream out of its container onto the ice in the bowl. Refreeze it for a few minutes if it has started to melt. 4. Add the wood chips to the fire. When you see thick clouds of smoke, place the ice cream in its bowl of ice in the center. 5. Smoke the ice cream until the surface is bronzed with smoke, 2 to 4 minutes. The idea is to add as much smoke as possible in the shortest amount of time. 6. Serve the ice cream immediately, or return it to the freezer to set up before freezing. That’s all there is to it! 1. Transfer the ice cream from its package to a cold deep metal mixing bowl and place that bowl over another bowl filled with ice. Cover the top bowl with plastic wrap. 2. Fire up your handheld smoking device. Place the end of the rubber tube under the plastic wrap and fill the bowl with wood smoke. Let infuse for 5 minutes. Repeat once or twice more, or until the ice cream is as smoky as you wish for. If the ice cream starts to melt, refreeze it. Smoked ice cream is outrageous served by itself, but it also makes an incredible a la mode for a Bacon Apple Crisp link or a Smoked Chocolate Bread Pudding link. Have a favorite smoked ice cream? Tell us about it by leaving a comment or posting on the Barbecue Board, Facebook, Instagram, or Twitter.